Being able to speak English provides children with so many more career opportunities when looking for employment after their education has been completed at school/college both here in Thailand and, perhaps, abroad. 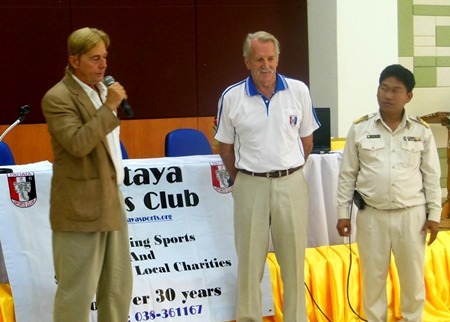 Nigel Quennell, president of the Rotary Club Eastern Seaboard, mentioned to Pattaya Sports Club that they were donating 300 English/Thai dictionaries to the Nongprue School for children in the age range of 5 to 9 years. The timing could not have been better and gave PSC the ideal opportunity to contact Philip Delaney (the school’s English teacher) to enquire whether some laptops would be useful in his efforts to teach the children with their English lessons. Philip Delaney welcomes the PSC and Rotary. To say that he jumped at the opportunity is a slight exaggeration but both the director, a senior teacher and Philip were present at the first meeting and all were overjoyed at the prospect. 4 laptops were provided as were 4 CDs helping Thai students to understand English. 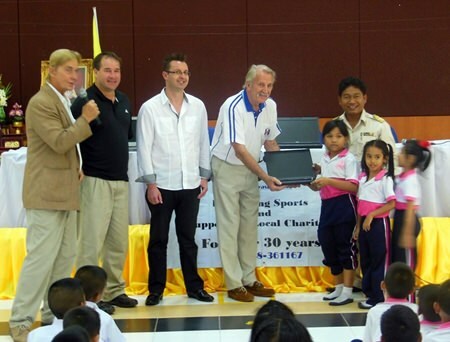 This came about because Pattaya Sports Club were presented with a number of laptops, programmed mainly in English, to donate to schools intent on teaching their students to read, write and speak English. Many of the children who will benefit from this imitative were there at the presentation, as were a delighted Philip and director. Philip and the director explain about the laptops. 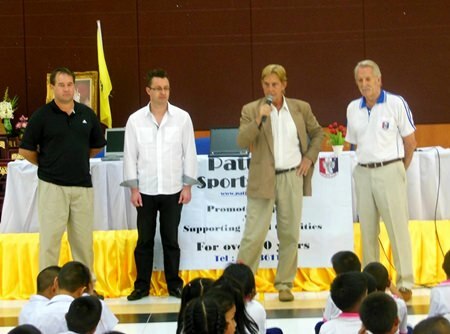 Pattaya Sports Club are always happy to contribute in whatever way possible to enhance the education of Thai children, and will pursue any opportunity that presents themselves to help young children further their education. The same can be said of Rotary. The laptops are presented to the children. It is good to see the children so happy. A group of children wait patiently.